Pictures by Tatyana Struchkova remind us of the Lyrical poems. This simple and laconic poems sounds in unexpected, allegorical way, and we appreciate the fabulous imagination of the talented author, which is presented so clear and imperceptibly. 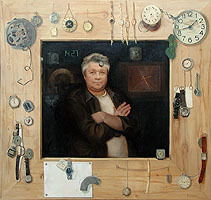 Sergey Belov works in various genres. It could be a portrait, still life, landscape or a figure composition. Fragmentarily, unusual foreshortening and resonance of the expanse, they all reflect the artist's view to the current days. Rogov's art differs from others by the combination of impetuous emotional painting's manner, delicate colours, and heightened sensibility in the perception of nature. Refinement of colour with simple, but finely constructed composition of a canvas is a characteristic feature of T. Chuvasheva's art. Being based upon realistic traditions, the creativity of Krestovskiy has included elements of other cultures. He likes to merge impressionism and naivety art, ethnic motives and realism.